great job on the sweetness and the texture! 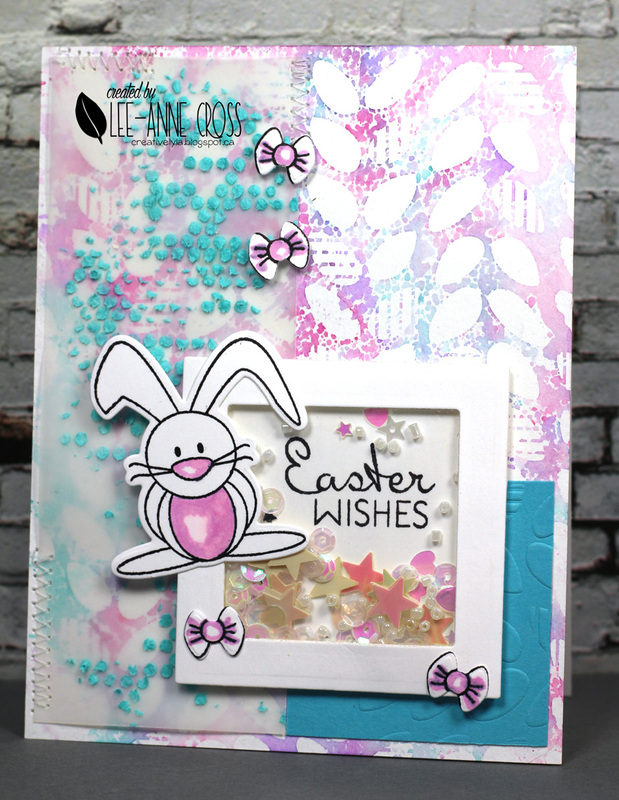 What a fabulous mixed media shaker card!! I absolutely love it!!! I love the mixed media effect in your card. The colors are brilliant! I really love the bunny, he pops off the page and the fact that it's a shaker card is just an added bonus!!! Awesome textures and layers on your fun shaker card! Love love your background on this card. Addition of the shaker box is good too, what a stunning card. Love all the extra textures!! It's a shaker card! I LOVE it! Great color and fun design! Wow, wow, wow! Just have to try some of the techniques you used. Never even thought about stenciling on vellum – gorgeous! And a shaker card, too! I'm in heaven!!! Love that mixed media background and the sweet little bows and shaker are the perfect accents. Such a fabulous card, Lee-Anne! Great background and love the shaker! Love the touches of turquoise and the scattered bows! What a great way to use them! Adorable, love the shaker window! Wow, so many layers and texture, great card. So colorful! Bunnies and bows rock the world, too, this time of year! So cute! My goodness your card is stunning, your background is stunning! What a great card. Amazing background. Love the texture and the little bows perfectly placed! Look at your sample card! Bunnies are fun, and so are shaker cards. Good job. love the cool mixed media look to your card… fabulous! Beautiful!! Love your color combo! Wow! That background is too fabulous for words! Love you card. Beautiful shaker card! Sweet pieces inside the shaker:) wonderful background and textures. Love your shaker and all the mixed media. I always get ideas from your cards…stencil, vellum, texture, color mix…Really Cool! I love this one !!! It is my favorite one !!! All the textures and details are fabulous! Such cute little bowties…I love shaker cards! Impressive creation with all sweet textures and fun stitching, love it! This card is so pretty. I like the distress ink background! Very creative techniques. Absolutely love the background! And the little shaker is awesome. I'm all about shaker cards. Great textures and what a fun shaker too! Adorbs! Cute card. The white on the background almost looks like bunny tracks. Shaker cards are so much fun. Lovely colors! Such a gorgeous and fun mixed media card! Thanks for the inspiration! Cute as it can be, the shaker is amazing! Whoa!! this is incredible – I never thought to stencil vellum. Going to give that a try now!!! 🙂 I'm a new follower of your blog and am so glad I found you via the Verve release this month. AWWW what a sweet Easter shaker card. LoVe your cute bunny. Thanks for sharing. So cute. I like the colors and texture.